Immersive Thermometers are portable test equipment instruments. Immersion thermometers indicate temperature level. Applications include laboratory, food and beverage, HVAC, and air temperature. Waterproof Thermometer is submersible and pocket size. Designed with a waterproof housing. Offers dual scale temperature measurements. Ideal for laboratories, food & beverage, HVAC and scientific markets. 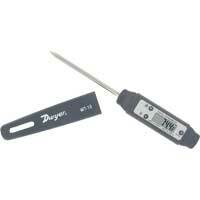 Retractable Needle Thermometer provides accurate measurements for testing internal temperatures during food safety inspections. Measures ambient air temperature.